On this date in 1427, the merchant-mayor of Wismar was beheaded — the incidental casualty of a Baltic trade war. The Hanseatic League, that vast trading cartel stretching from Europe’s Low Countries in the west to Novgorod in the east, was in its glory at the start of the 15th century. The Hanse dominated Baltic trade. Its major rival was Denmark, which had brought most of Scandinavia together in the Kalmar Union. Come the 1420s, the Danish monarch was Eric of Pomerania, a handsome and headstrong king. He would come to blows with Hanse cities over the Duchy of Schleswig. Schleswig is the “neck” of Denmark’s Jutland peninsula. In the present day, the German-Danish border splits Schleswig horizontally: north Schleswig is Danish soil; south Schleswig, German. 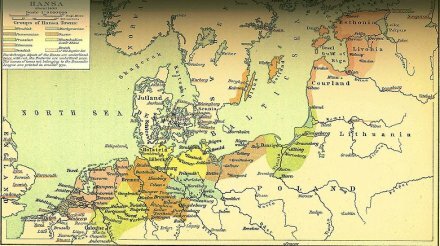 To summarize a complicated history, the historical Duchy of Schleswig was long a bone of contention between the pre-modern precursors of those current states. 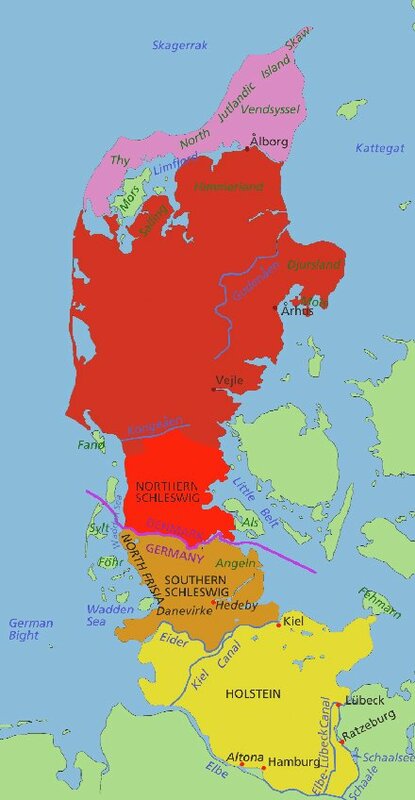 Since Germany was very far from a unitary entity where we lay our scene in the 15th century, Denmark’s immediate rival for Schleswig was that territory’s southern neighbor, Holstein. Eric had fought intermittently in the 1410s and 1420s against the counts of Holstein over who controlled what and upon what terms in south Jutland. After securing a legal ruling favorable to his claims from the Holy Roman Emperor, Eric in 1426 began enforcing his rights by force. Holstein in turn sought aid from Hanseatic towns many of whom — wary of Denmark as a rival to its Baltic trading stranglehold — did indeed enter the fray on the side of Holstein. Hanseatic ships began raiding southern Denmark in the spring of 1427. Wismar, a Hanse wool-trading port just a few kilometers outside of Holstein, was one of these cities. Johann Bantzkow (German link), its merchant ruler, supplied some 200 sail for the Hanseatic flotilla. Unfortunately for the Hanse, and for Bantzkow, the Danes proved to have naval superiority and dealt a crushing defeat to the Hanseatic fleet on July 11, 1427 — then once again on July 25. A number of Wismar ships were captured in the process. Public anger in Wismar was intense. That city had seen its own social conflicts in the generations preceding between the town’s patricians and its guilds; now popular anger over the souls lost at sea caused Bantzkow’s fellow-mayor Hinrik van Haren to be slain by the mob. Bantzkow himself was condemned judicially, and his influential family could not manage any better succor than a death by the sword instead of the horrible prospect of the breaking-wheel. Claus Jesup (German link), a leader of guilds, made himself mayor of a rearranged political order. The prospective realignment was itself reversed in 1430, and the re-established magnates put up a Bantzkowsche Sühnekapelle (German again), or Bantzkow Penance Chapel, to atone for the unjust beheading. Regrettably, the chapel was demolished in the 19th century. Given setbacks at sea, Holstein and its remaining Hanseatic allies focused on actual conquest in Schleswig, and with much better success. Eric was eventually forced after great expense to sue for a costly stalemate,* an affair which helped to undermine Eric’s own hold on power until he was finally deposed in 1440. However, Eric’s success on the seas — and his urgent need for funds — led to his establishing Denmark’s Sound Dues on 1429, collecting lucrative tolls from all foreign ships sailing between the Baltic Sea and the Kattegat. ** This tax would remain a pillar of the Danish state well into the 19th century, at times providing up to two-thirds of the government’s operating income. A new Hanse was re-founded in 1980 as a cultural exchange network among the historic cities of the federation. ** It’s thanks to Sound Dues that Elsinore, the main tolling point, got big and rich enough for Shakespeare to set Hamlet there.